This training section is relevant if you wish to import case data from an external system such as Perfect Portal. External matter data is automatically imported into Partner every 10 minutes or so. This data will be from Perfect Portal or your own portal/website. Check the CASE TYPE is correct. See next section if you need to create a matter for an Existing entity. Make a written NOTE of the new Entity Reference, displayed in a popup. Locate the Entity and Matter in Partner, and begin the new Workflow. Set the Entity Ref between the Begin and End Markers - be careful not to delete the greater/less than symbols. The Matter will have now been created for you. Locate the Matter, progress the case flow. The step PRO Open Purchase Case will be automatically available in the workflow. Right click the step, select ''Complete Step''. All of the details from the Portal will be entered for you, except for Type, please set House/Flat/Land. The answers to the next questions will depend on whether the case was imported from a Portal, or if the case was created from scratch with no initial data. In all cases the Portal values will be displayed as teh default values. Continue through the following questions, selecting the answers appropriate to your case. It is most likely that if the data has been imported from a Portal that you will wish to NOT to re-calculate any fees, that is unless you wish to modify an incorrect Portal value. Each fee calculator (OurFee, SDLT, or Land Reg calculator ) will always will give you the option to modify the fee. 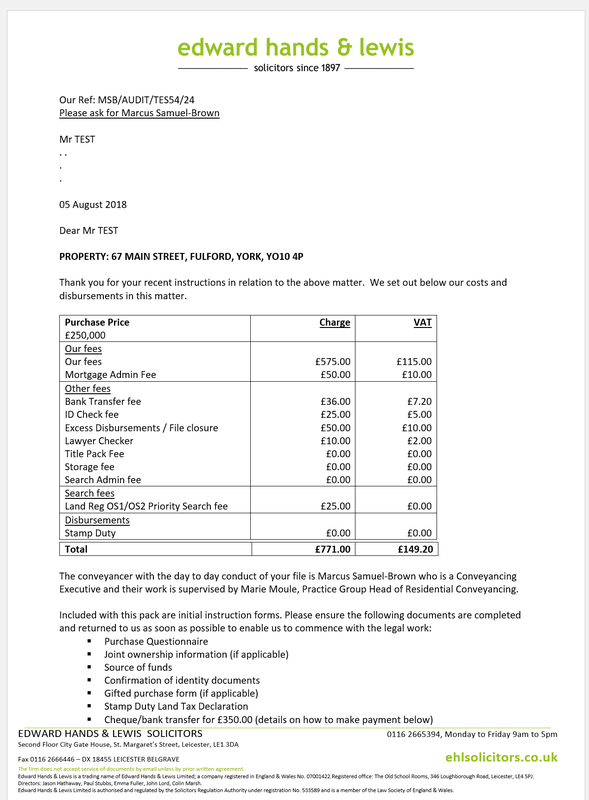 If the basis is wrong, say the client is actually a First Time Buyer, Select Yes, as this will allow you to enter the correct calculation basis values. 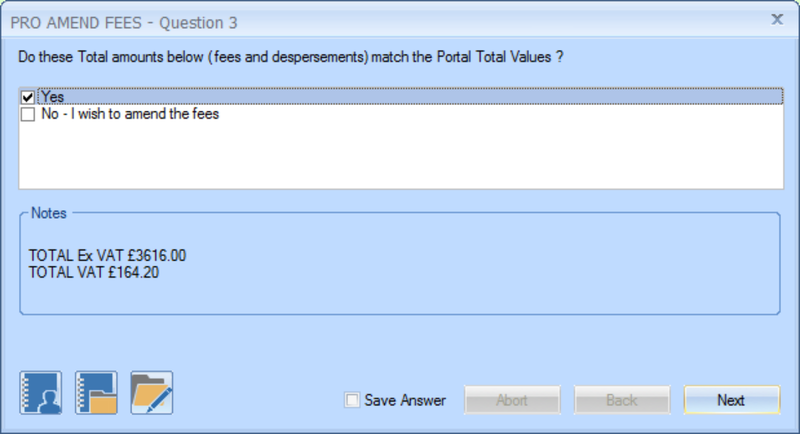 Simply Check the fee Totals presented in the next question with the documentation / online reference to relating to Portal Fee totals, if they match the fees have most likely imported perfectly, so select Yes. The Financial Entry view will now open, modify entries as required. Edit or confirm the Money On Account to request and click ''OK'' to proceed. 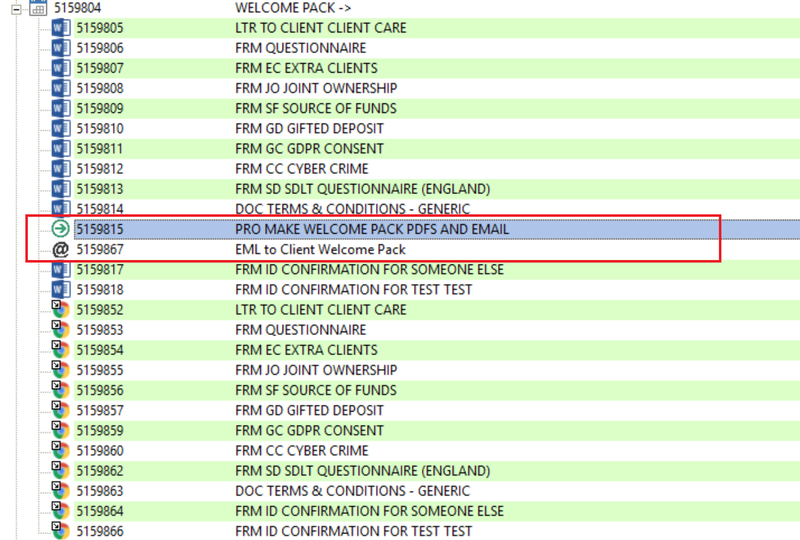 Client care letter will now merge, select the client from top section, select OK. Please now allow documents to be merged and awaiting items to be inserted into the workflow. When finished the workflow will display in a folder/sub-agenda style layout. The Lean scanning solution will automatically place Post-Room scanned documents into this folder. Please also use this folder when dragging documents received by email. It is faster for everyone to find documents we have received in one place. Expand this agenda to find .. Please now follow the instructions in the next section. Navigate to ENGAGEMENT-> WELCOME PACK-> in case History. Letter stationary will be auto set to match the matter Branch. Sense check by comparing the total amounts to the printed copy or Portal reference. Select the Client Care letter step. Click the Revert icon in the Case Ribbon top of Partner for windows interface. 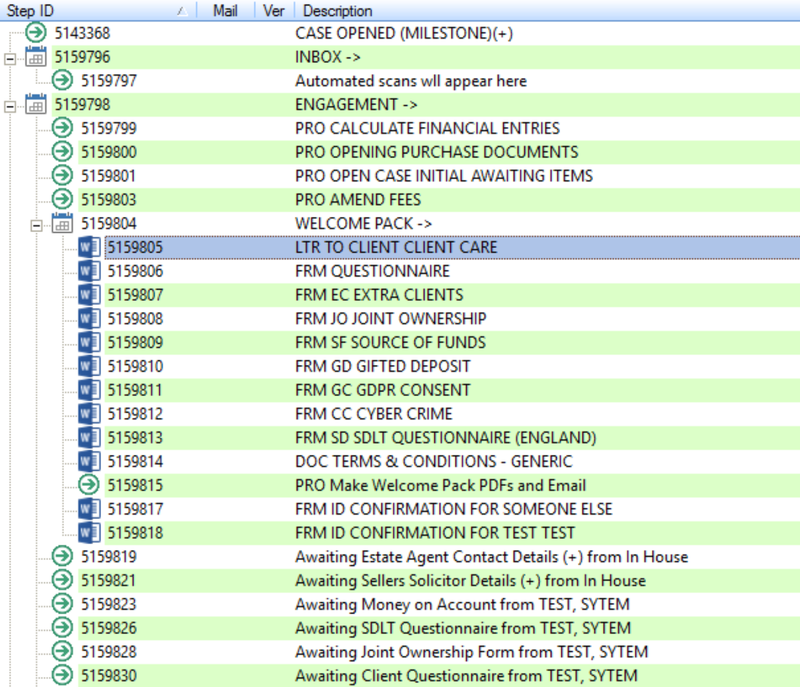 Click Create Edit from the Ribbon to re-merge the Client Care letter, check totals, repeat if necessary. Check the Terms and Conditions document. You should find the Search pack and additional charges section has automatically been set depending on the referrer. 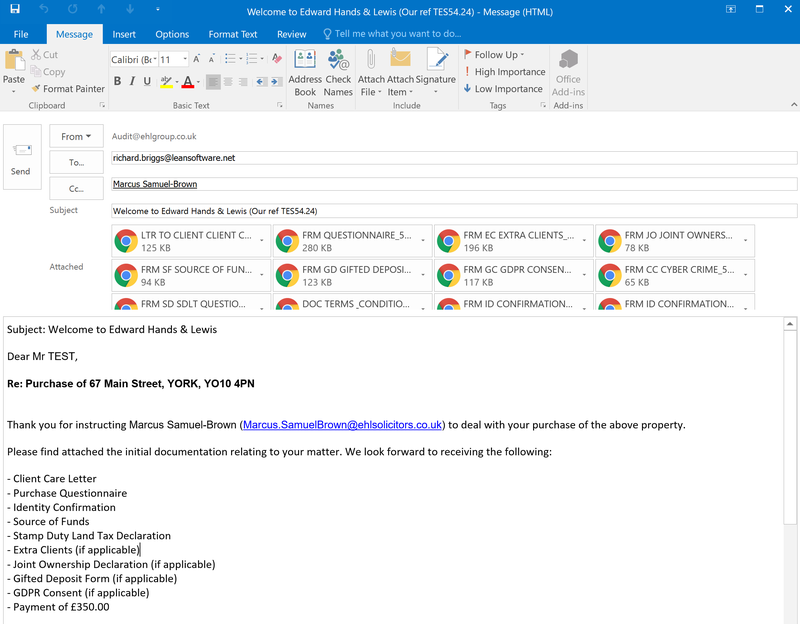 You may notice that every Form has the client reference and document reference included in the top left of each document, this is so that the scanning solution can automatically recognise the document when scanned into the system. The Email Step may not be visible as Partner does not refresh the workflow after making the PDFs. In addition a Partner bug means a new case history window is created every time a PDF is made. Close all of the Case History windows and re-open the matter.